Sift the whole wheat and all-purpose flour together in a large mixing bowl. Add baking powder, salt, and cocoa powder. Stir in coconut oil, agave, and warm water to form a large ball of dough. On a floured work surface knead dough for 5 minutes. Cut the dough into 16 pieces. Roll each piece into a ball. Let it rest for 10 minutes. On a floured surface, roll the dough into 6-inch circles. Heat up the cast iron skillet. Don’t add oil. The tortillas need to cook on a dry surface. Once the skillet is hot add one uncooked tortilla. Cook for 30 seconds per side. Place the cooked tortillas on a plate lined with a damp paper towel. Continue until all 16 tortillas have been cooked. 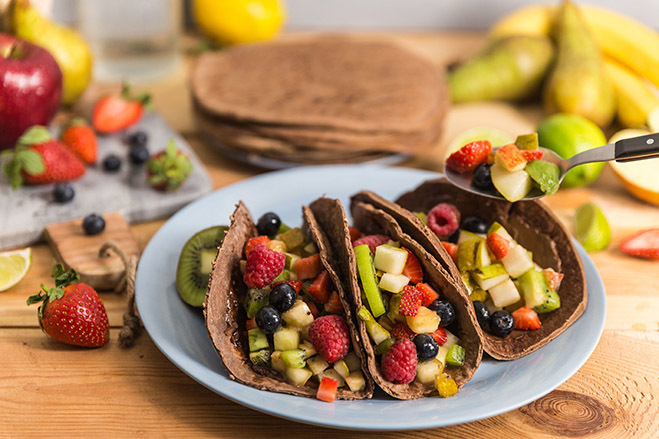 Fill tacos with fruit salad mix. Top with whipped cream.